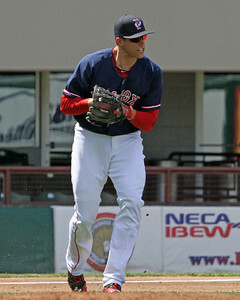 Cecchini was 3 for 5 with two runs scored, a home run and an RBI, leading the PawSox offense. A quick offensive start and a strong performance on the mound propelled Portland past the Altoona Curve (PIT), 5-1. Brian Johnson moved to 4-1 on the season thanks to his six solid innings of work, allowing just one run on four hits and a walk, punching out six. Mike McCarthy and Aaron Kurcz combined to toss three scoreless innings of relief. The Sea Dogs plated three runs in the first on a Blake Swihart RBI double, Sean Coyle RBI ground out, and a Stefan Welch RBI single. Deven Marrero would add an RBI single in the third and David Chester would cap the scoring for Portland with an RBI single of his own in the sixth. Derrik Gibson was a perfect 3 for 3 from the top of the order, continuing a hot start to the month of June. The 24-year-old has gone 12 for 26 this month with two doubles and seven RBI. 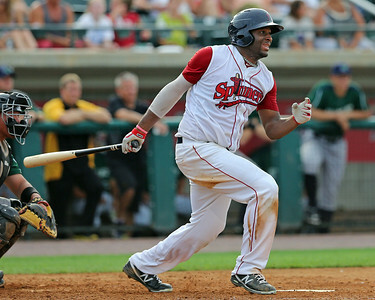 The Fredrick Keys (BAL) used an eight-run second inning to slip past the Salem Red Sox, 9-7. Cody Kukuk received the start, but lasted just 1 2/3 innings, allowing seven runs on five hits and three walks. He was relieved by Justin Haley who hurled 6 1/3 innings, allowing two runs on six hits, walking none and punching out seven. The Red Sox held a 3-0 lead after an inning, thanks to a Carson Blair three run home run. In the second, Kukuk came unravelled, allowing five runs on five hits and two walks before exiting. Haley allowed a three-run home run to the first batter he faced, allowing two of Kukuk's runners to come around to score before securing the final out of the inning. Aneury Tavarez smashed a three-run home run in the fourth to help the Red Sox begin to claw back, 8-6. In the sixth, a Tim Roberson solo home run brought Salem to within one, 8-7. The Keys pushed across a key insurance run in the bottom half of the inning, and were able to keep the Red Sox at bay the rest of the contest. The loss is the third in a row for a Red Sox squad that currently finds itself 12.5 games behind first place Myrtle Beach (TEX) in the Carolina League's Northern Division. Greenville was unable to overcome a late offensive rally by the Charleston RiverDogs (NYY), falling 8-5. Jamie Callahan got the starting nod for the Drive, tossing the first four innings, allowing two runs on six hits and two walks, striking out five. Ellis Jimenez took the loss, allowing six runs on five hits and two walks in just 1 1/3 innings of relief. Greenville lead 3-2 after four thanks to a Kendrick Perkins (pictured, left) sacrifice fly, a Carlos Asuaje RBI single, and a Perkins RBI triple. The Drive would extend the lead to 4-2 in the seventh as Asuaje added another RBI single. The RiverDogs surged in the eighth, plating six runs to grab an 8-4 advantage. In the bottom half of the inning, Greenville got one run back on an error. Despite the defeat, the Drive collected 14 hits, three each from Perkins and Manuel Margot. Perkins has been hot thus far in June, going 10 for 26 with two home runs and four RBI in seven contests. A late offensive surge lifted the DSL Red Sox to a 8-6 victory over the DSL Rojos (CIN). Ritzi Mendoza picked up his first win of 2014, tossing five shutout innings, allowing just three hits and a walk while striking out two. The Red Sox wasted no time scoring in this one, plating a run in the first on a Rafael Devers RBI single. In the second, the Red Sox plated two more on a Carlos Tovar RBI single and a wild pitch. The Rojos would score a run in both the sixth and the seventh to pull within one before the Red Sox responded in a big way in the eighth. With the help of an error and three consecutive bases loaded walks, the DSL squad scored five times, including a key RBI double from Gerardo Carrizalez. The Rojos rallied in the ninth, scoring four runs, but did not have enough to complete the comeback. While the Red Sox were just 4 for 16 with runners in scoring position, they made the most of the eleven walks they were issued. The team's 6-3 record is currently good for a three-way tie for second place, two games behind the first place DSL Yankees1 team. Player of the Day: Garin Cecchini, who was a thorn in the side of the Louisville Bats (CIN) during Pawtucket's 4-3 victory on Tuesday. The 23-year-old third baseman has been scuffling as of late, but was 3 for 5 with two runs scored, a home run and an RBI to lead the PawSox offense. The home run for Cecchini is his first since April, when he hit .312/.400/.390 before cooling off in May to a .253/.315/.293 line. Cecchini has enjoyed hitting at McCoy stadium this season, hitting .298/.388/.413 in comparison to a .242/.308/.263 average on the road.